Meet Amelia Seymour, professional infant sleep consultant. Today I’m introducing you to Amelia, she’s joining the regular lineup on NANNY SHECANDO to share her expert infant sleep advice. 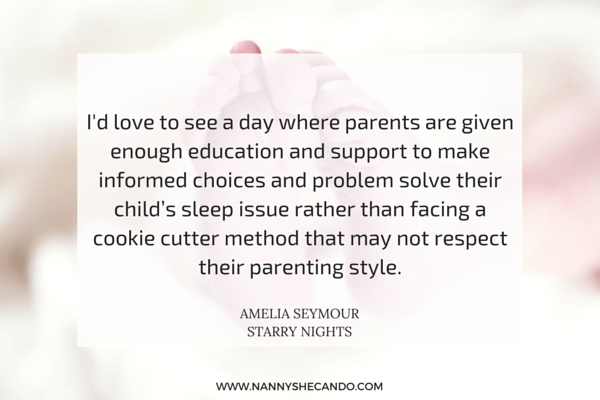 Whether you’re a career nanny working with infants, or a sleep deprived mum desperate for the answers to achieving decent night’s sleep, Amelia will do her best to share her wisdom. We took a moment with Amelia to learn more about her career and philosophies on being a sleep coach. Amelia Seymour: My career as a nanny was forged from a strong desire not to follow in my parent’s footsteps, and also as a result of returning to the Australian country. I spent several years working on rural stations in Central Queensland with a mixture of ages. During this time, organisation and routine were critical and the close bonds shared by all members of the rural community intrigued me. In an effort to find ways to recreate this support network within the modern city lifestyle I stumbled across the Secure Parenting framework, a philosophy that fits beautifully with my own beliefs. The stark contrast between this model and the well known cry it out methods used to teach self settling became my biggest battle. I was determined to find a solution that incorporated the positives of attachment parenting with the organisation and routine of infant schedules. A great deal of research and personal experience volunteering with families from the multiple births association followed and my role in infant sleep was born. What steps did you take to collect such extensive knowledge, experience and expertise? I’m really fortunate that within my role I have the opportunity to chase after and learn about something that I am so passionate about. The best way to describe the personal development aspect is to consider a circle model; around that circle are 3 major areas. The first, Research, is born out of that immense passion and involves staying at the forefront of infant mental health, sleep and nutrition. It’s not enough for me to know that something works. I want to find out why; the scientist in me craves the logical, evidence-based answer. As a result you’re more likely to find me pouring over scientific journals on a night shift than reading the latest fad sleep book. As much as this research is invaluable, the downside is it is written by scientists for other scientists/health professionals so usually doesn’t have a great deal of real life application. One of the most effective ways to bridge the gap between research studies and real life is through professional development courses. When I come across a technique or study I am interested in, I then start contacting the authors in the hopes of discovering how they intend to apply the results in practice. Sometimes you catch a lucky break and there is a course aimed at parents/professionals, most of these are in the form of international webinars and are extremely helpful tools. Finally it’s time to take what you have learnt and put it into practice. I have to take a moment here and say a huge thank you to the Australia Multiple Births Association and the families who have allowed me into their homes in a volunteer capacity. It is a result of their generosity that I have been able to gain a wide variety of experience with challenging cases. In addition to regular sleep clients, my work with AMBA allows me to seek out specific situations and build experience with conditions requiring a unique approach that I may not come across regularly. If I could give one piece of advice to those starting out in this field, get in touch with your local club, log some volunteer hours and search for the cases that you don’t have instant answers for. Your time will be greatly appreciated and you will learn far more being hands on with a difficult case than you ever will from a book. Philosophy when working with bubs and families for sleep training assistance? My initial response would be to say I disagree with the phrase “sleep training”, to me it conjures up an image of an army officer barking to his recruits to train harder, work faster or in this case sleep better. Sure we have all had moments where we scream to the heavens and beg our children to go to sleep, but is the forceful training mentality really the way you want to accomplish this? 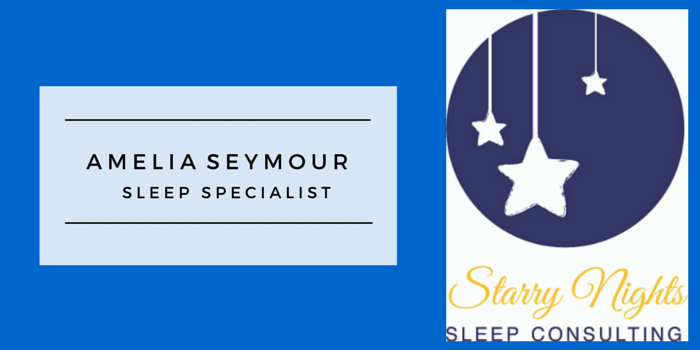 I like to think of sleep consultants in more of a coaching role, I don’t want to step in and solve the problem for you, but I do want to motivate you and set you up so that your goals are more easily attained. I want to work with you to find the best fit for your family and yes in some cases that means educating and problem solving with you, but in just as many my role is to support and motivate you. Do you have a particular method or book that you follow? No not really, whilst there are a few basic components that make up any sleep program, I find far more success when the family comes together with me to develop a plan that uniquely suits them. Do you mostly work with little bubs or older children as well? The majority of my work is aimed at children under the age of 2. Once verbal language and comprehension are significantly developed the approach needs to change dramatically to address this. Rather than attempt to stay on top of a wider range of techniques and research for older children I prefer to provide a more specialised service for infants. Would you call yourself a baby whisperer? No, again I have to say that a sleep program is a team effort between the family and yourself. One of the biggest things to remember is whilst you have experience and training, with this child you are brand new, and there is no one in the world that is going to know that child better than their parents. They are your biggest resource, tap into that! How do you balance providing support with delivering key info to fatigued parents? This is so dependent on the individual situation but I would say it is definitely skewed on the encouragement/support end of the spectrum. Most sleep programs will work if applied consistently and many parents just need the encouragement, support and education to commit wholeheartedly to an approach. What’s the typical process for a sleep consult? I usually start by giving the family an intake questionnaire that covers everything from their child’s day, to their parenting philosophy, their goals and what they have tried previously to address the issue. This may be in the form of an in house visit or phone chat but is usually done via email and gives me a great snapshot into their situation at present. From here they will go away and complete a few days of sleep logs before I visit for a few hours to observe and develop a sleep plan. For many families a plan combined with regular communication and reassessment is enough, for others a more hands on, supportive approach is needed. If additional assistance is required I would usually start with a half day or night shift that assists parents to implement the plan and covers the various contingencies when things don’t work immediately. From this point follow up support is critical and I would arrange for sleep logs to be sent to me until the goals are met, along with daily follow up calls or emails for the first week, and as required for the next 2-3 weeks. Do you have a mentor or fellow expert to discuss methods or scenarios with? I’m a member of several sleep consulting/maternity nurse groups and associations that allow me the opportunity to learn from others and bounce around ideas. I have a lot of respect for these people who are working hard to develop and educate parents about a holistic approach to sleep. Your top tip for a first time mum with a newborn? No one in the world knows your baby better than you and your partner, trust your instincts and be proactive about asking for help. >>> Do you have a question for Amelia? 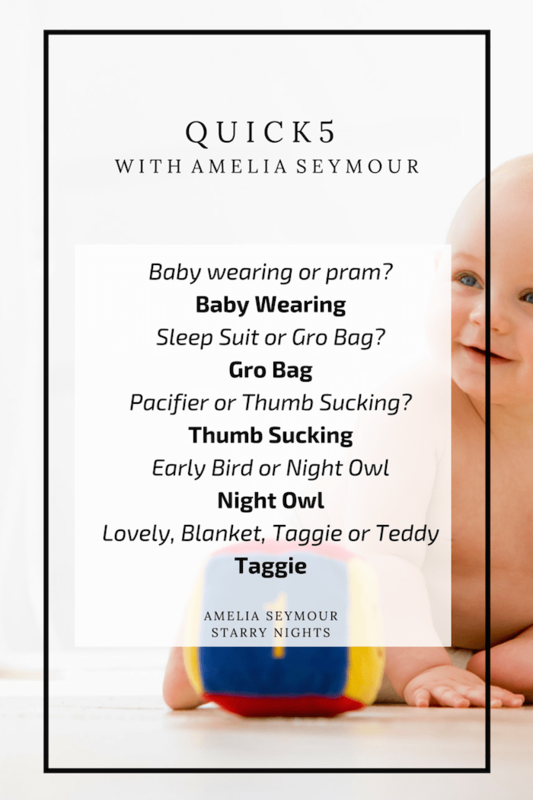 Email in your question or leave a comment and Amelia will answer your questions in her regular Infant Sleep Column. Aw you are right! Yes we can get all the advise in the world but only me and my husband will know our baby well enough, more than anyone else. The advise may or may not work, right? It’s all up to us to decide which ones to try with our newborn. I really would love to have some sessions with Ms. Seymour!